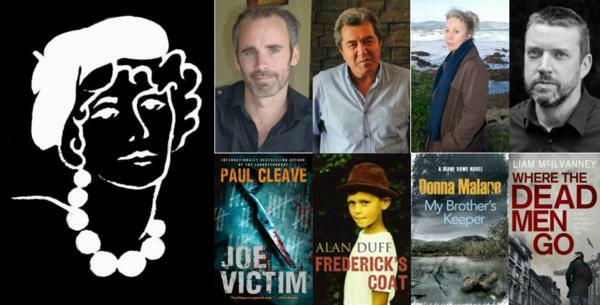 FOUR OUTSTANDING novels have been announced as the finalists for the 2014 Ngaio Marsh Award for Best Crime Novel, which will be presented on 30 August following The Great New Zealand Crime Debate event at the WORD Christchurch Writers & Readers Festival. The Ngaio Marsh Award is made annually for the best crime, mystery, or thriller novel written by a New Zealand citizen or resident. The judges praised JOE VICTIM as “visceral” and packed with “clever dialogue, black humour, and incredible twists”; called FREDERICK’S COAT a “unique and sensitive book in style and subject matter” with “terrific writing and great characters”; said MY BROTHER’S KEEPER was a “consistently compelling and character-rich story” that was executed with rare “grace and human complications”; and rated WHERE THE DEAD MEN GO as a “thought-provoking novel with very real characters and a fascinating, complex plot” that wove in topical and important real-world issues. This year’s winner of the Ngaio Marsh Award will be announced at a ceremony at the conclusion of the “Crime Doesn’t Pay” debate event MC-ed by Joe Bennett at the Rydges Ballroom on the evening of Saturday, 30 August 2015. The winner will receive a set of Ngaio Marsh Award novels courtesy of HarperCollins and a cash prize of $1,000 provided by the Christchurch Writers Festival Trust. The Award’s namesake, Dame Ngaio Marsh, was a Christchurch mystery writer and theatre director renowned worldwide as one of the four “Queens of Crime” of the Golden Age of Detective Fiction. More than 110 years after her birth her books remain in print and beloved by many generations of readers. The Award was established in 2010 with the blessing of Dame Ngaio’s closest living relatives.